I have had Dr Kerry Spackman’s ‘the winner’s bible’ for a while but haven’t really committed serious time to reading all of it. I decided now was a good time. He talks about being able to re-wire your brain. As psychology and NLP run quite close together I was interested. 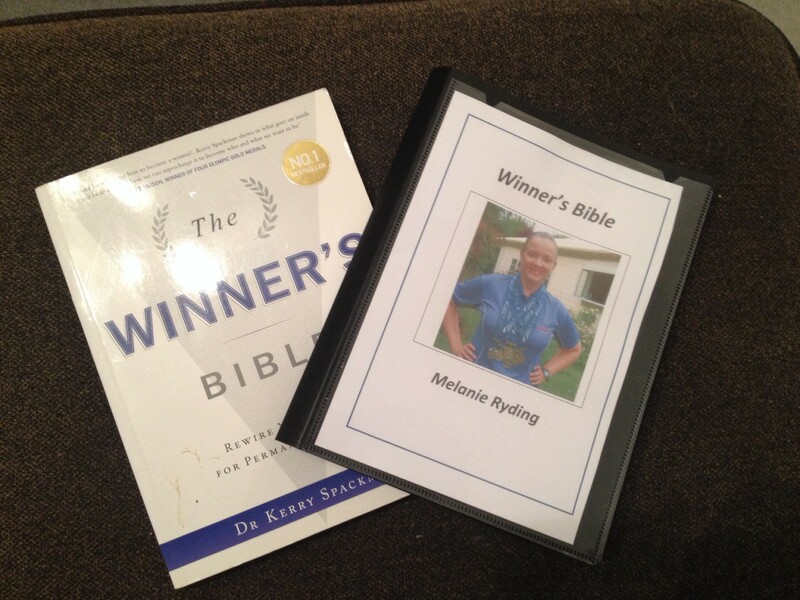 The books guides you through making your own ‘winners bible’ and I had started one but not finished it. Me.inc. This is a mind map of my life, all elements. I used the app ‘simple mind‘ for this. It’s purpose is to illustrate all elements of your life so you have a visual. To check if you are taking care of ALL of it, or focussing too much on certain elements at the expense of others. My happy section This is a few pages if images that represent all the things about my life at the moment that I actually like/ love / enjoy. These are a visual reminder at the front of my book because I know that I can often get consumed in smaller details without remembering the bigger picture. Photos of my heros and mentors People who have or continue to inspire me. My strengths and weaknesses and repeated mistakes To help me fill this in I enlisted the help of 5 family members / friends. It is important to get a balanced view here. This page was a very interesting exercise. Carpe Diem Am I seizing the day? This is a series of questions I intend to revise as I use my bible. My intrinsic Drivers. Kerry details a great exercise to find out what theses truly are. My career goals I put this further back because it is less important to me in the grand scheme of things right now. Photos of material goods These are things I would like to own. Reality not fantasy. My Wheel of life. This is a snapshot of where I am now, dated, and intended for revision also. Poems and quotes That are important to me. This entire book is intended for constant review and updating. It is meant to be a working document. I call call it my personal book of positivity. Great book, I’ll let you know how I go. Meanwhile, if you want to make your own, visit his web site because there is a neat little a5 template there for you to download. This is a really great idea. Thanks for sharing. I just have to keep repeating to myself, Nothing tastes as good as healthy feels. You’re dead right. That’s a great point excellently worded!